I watched the sunset from VANilla last night. It was very nice and a little bit of a surprise. I kept trying to catch an amazing sunset shot on the coast, but the colorful sky over the lava fields proved to be a better place for a picture. But more importantly…on to the morning. 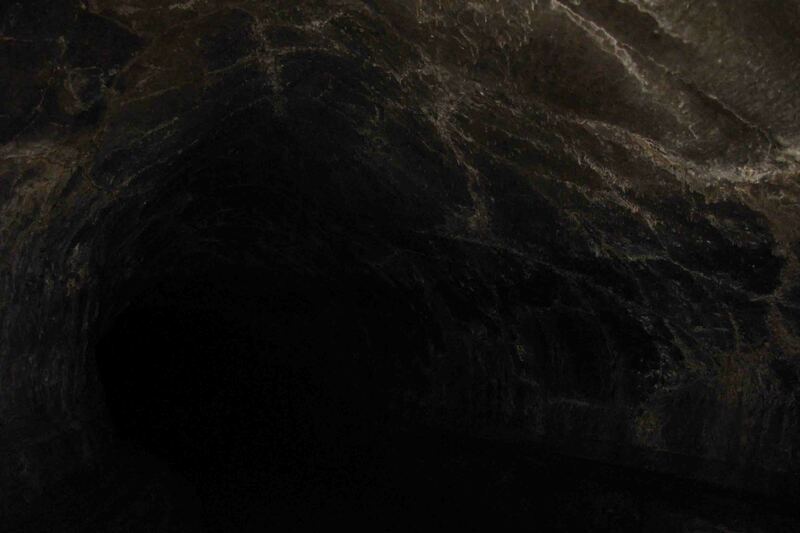 A morning of caving…that certainly was a new experience. I’ve been in several caves, but it has either been with a guide or it was an extremely shallow cave where the opening could always be seen. 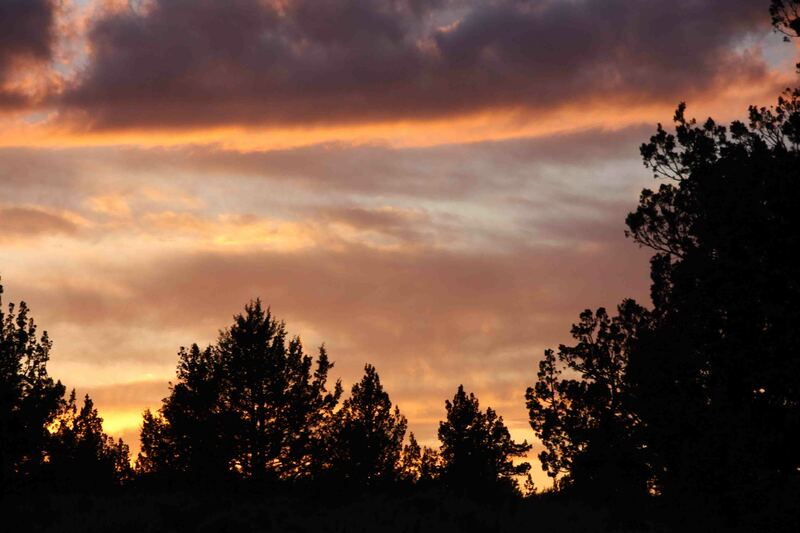 The Lava Beds National Monument allows visitors to explore caves without any supervision…incredible! I went into seven caves today and made it to the end of four of them. The two others were a little too long and dark for me to wish to continue alone especially with the option of more than one passage way and with virtually no one around to help if something were to happen. Approximately half the caves were open today. 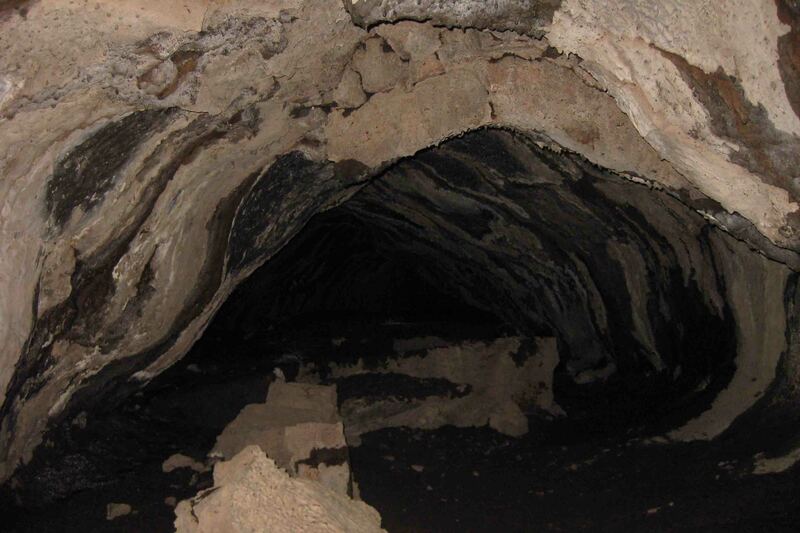 The other half were currently home to bats that are sensitive to a bacteria that humans carry, thus the caves were closed off to protect the colonies. That worked for me, as I’m not certain that I would have been thrilled to find a bat while exploring myself. Of the caves that were open, I opted for the “Least Challenging Caves” and the “Moderately Challenging Caves”. The least challenging caves have relatively high ceiling and smooth floors or trails, thus cavers may explore them while standing up. 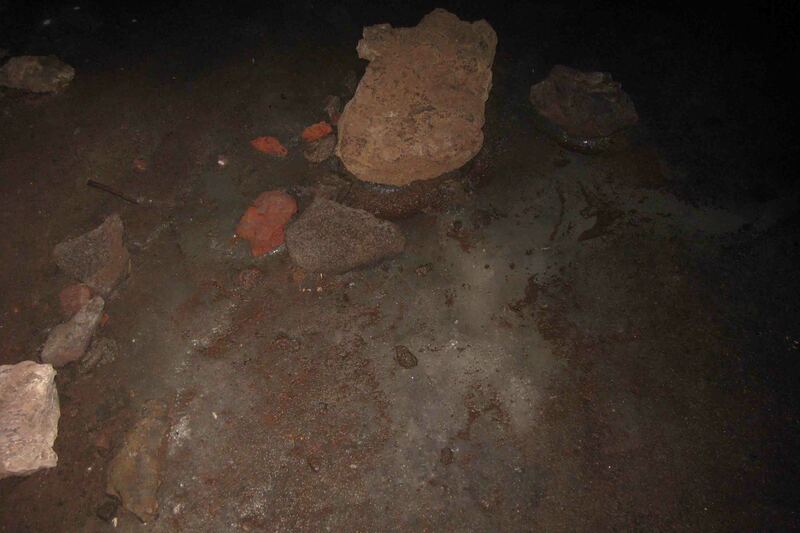 The moderately challenging caves require some stooping through low sections and negotiating rough, wet floors. 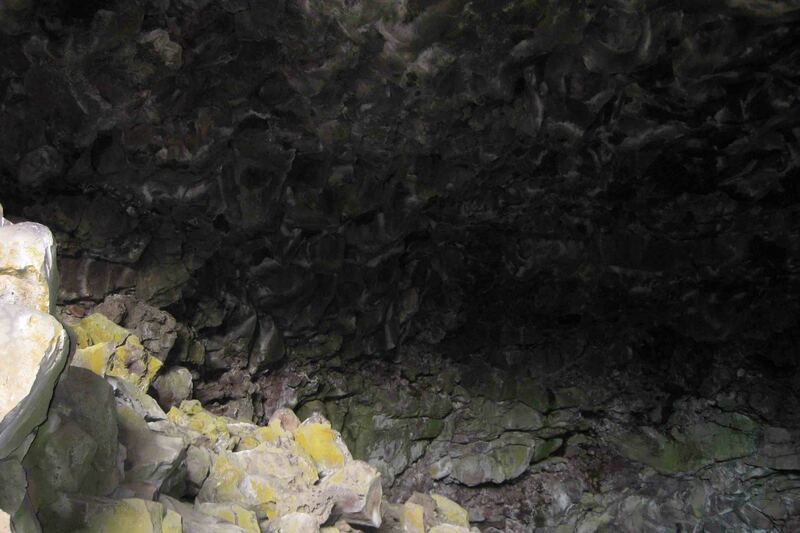 While all the caves required two sources of light, these types of caves did not require knee pads, gloves, and helmets which were required in the “Most Challenging Caves”. After seeing all the signs posted warning to cave in groups or tell a friend where you will be, to carry two light sources and extra batteries, and to make note of the route taken into the cave, I chose a short cave first. Big Paint Cave was only 266 feet in length and was a site where Native Americans came for vision quests and other religious practices. The pictographs in the cave portray visionary images experienced during these spiritual quests. My next stop, Skull Cave, was named for the bones of antelope and mountain goats, bighorn sheep skulls, and two human skeletons discovered inside. 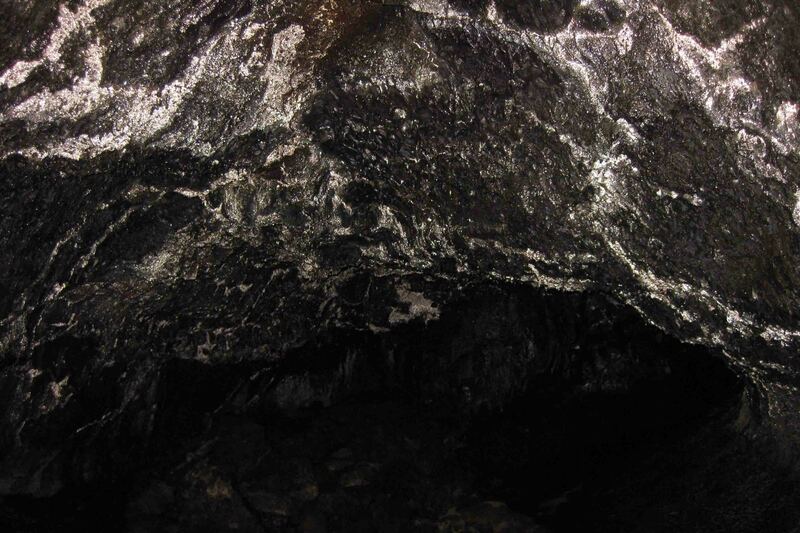 It is a remnant of two very large lava tubes, one on top of the other which allows cold winter air to be trapped inside. As a result, a year-round ice floor is created! This cave was 580 feet long and required lots of stair climbing to get down to the ice floor. It was so dark even with both my head lamp and flashlight on, that I could hardly see the ice floor. It’s one of the few times a picture is better than being there. On a different note, Skull Cave was also a virtual cache! Next I stopped at Merrill Cave. It used to have an enormous ice floor that visitors used to ice skate on by lantern light years ago. It began melting in 2000 and now only remnants of ice may be seen. I didn’t see any remnants and think the visit to this cave could have been skipped…just my personal opinion. would lead me to the dome and the possibility of circling in the dark seemed a bit unnerving to me, I promptly returned to the ladder and exited the 2,229 foot cave. The gold in the dome is the result of light reflecting off water droplets that bead up on a coating of hydrophobic bacteria which is evidently harmless to human. This gold could also be found in the Sunshine Cave, so I stopped there next. the end…I almost ended up on my hands and knees to crouch below a low hanging area before entering a small cavern with hydrophobic bacteria. I lost my balanced as I crouched to almost a seated position on my heals and did a little pinky finger slicing on the sharp lava rock. I was trying not to touch any of the rock to protect the cave and of course to keep from accidently sticking my hand in bat or rat dung. I had hoped to see some icicles as well, but they are only present in the winter. Continuing south, I stopped by two more caves before leaving the park. 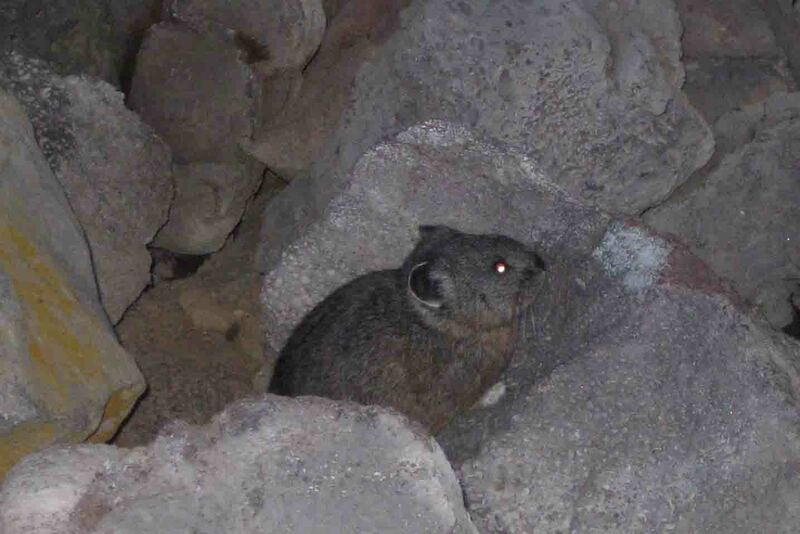 At the entrance of Indian Well Cave, I was greeted by a tailless rat (if those exist), so my visit didn’t last long. The ceiling was extremely high and the floor very low, so it was like being in an enormous cavern. I stood on a side ledge and looked down into the cave. The path down to the floor looked rocky and steep, and I didn’t see any unusual ice formations that can be found in the winter, so I left, as it didn’t look interesting enough for the work involved. My final stop was the park’s best cave. 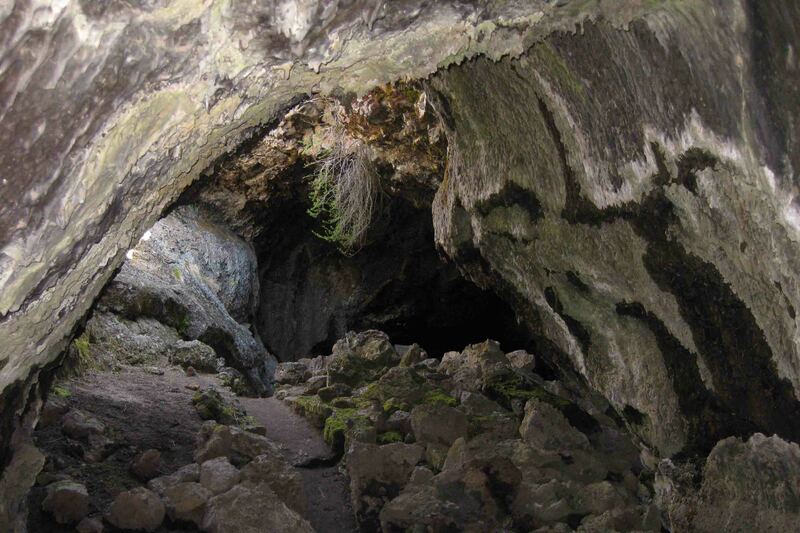 Valentine Cave, 1,635 feet long, was discovered on Valentine’s Day in 1933. 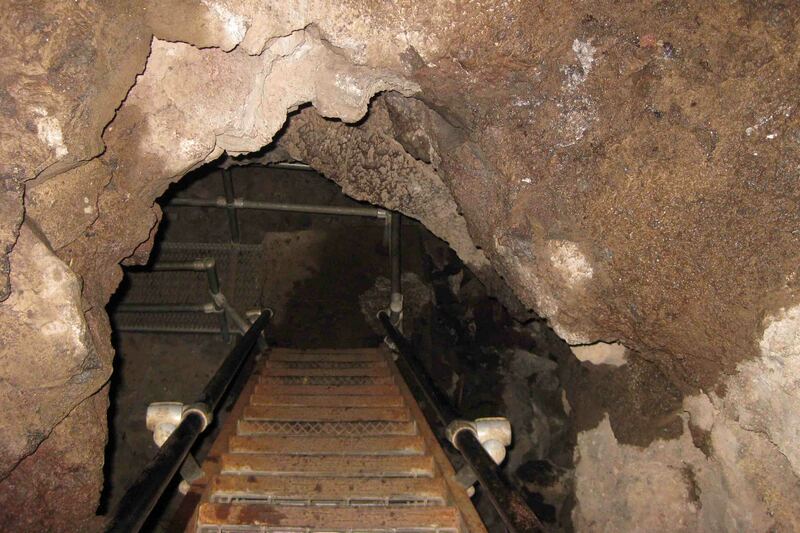 The cave has large main passages, yes plural, passages. At first I took the passage to the right. I thought, if I always stay to the right, I could reverse my route easily, until I saw more passages that were lower and smaller. So, I decided to go to the left. I slowly stepped on the wet floor as I shined my light all around to keep my bearings, but it is truly amazing how different the cave can look from the opposite directions. Once I got deep enough into the cave where I could no longer see light coming from the entrance or light coming from another area, I could feel my adrenaline jump up a notch. I really wish someone else were with me because I really wanted to go all the way to the end, but it would have been rather cavalier of me to go alone with Petey stuck in VANilla. Anyway, the morning was definitely a new experience for me. 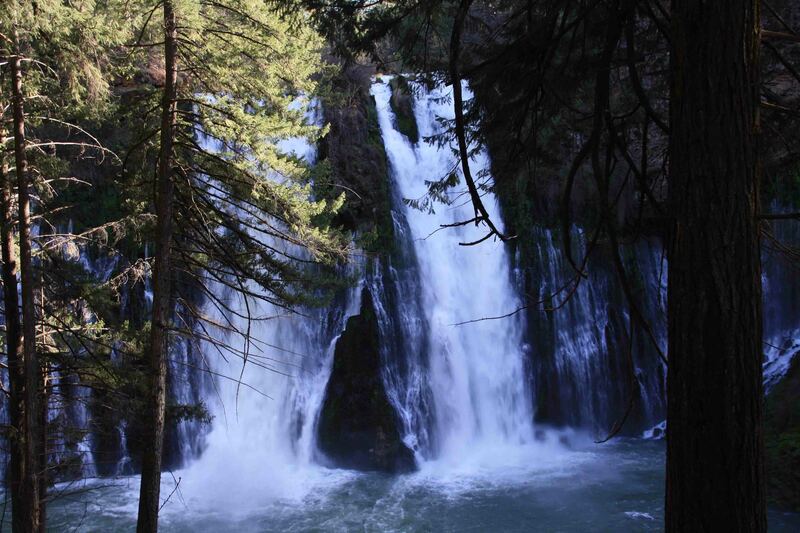 This afternoon I ended up at McArthur Burney Falls Memorial State Park. 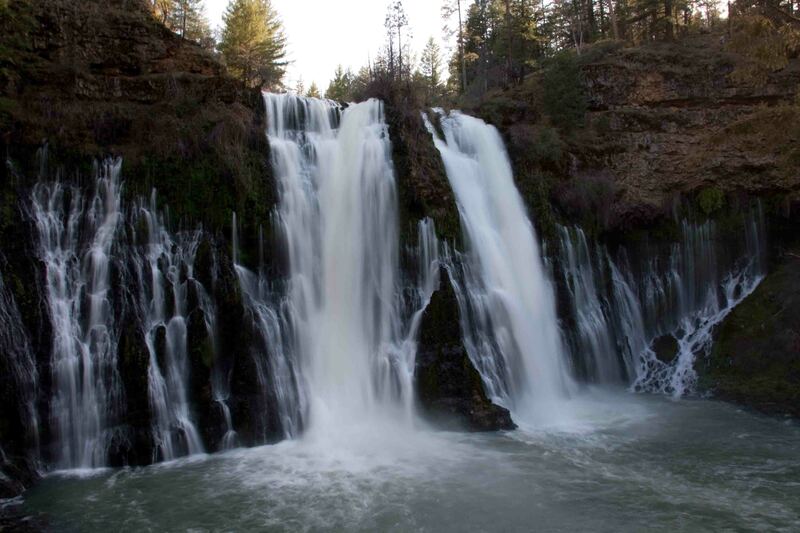 The main attraction at this state park was Burney Falls and it was magnificent. 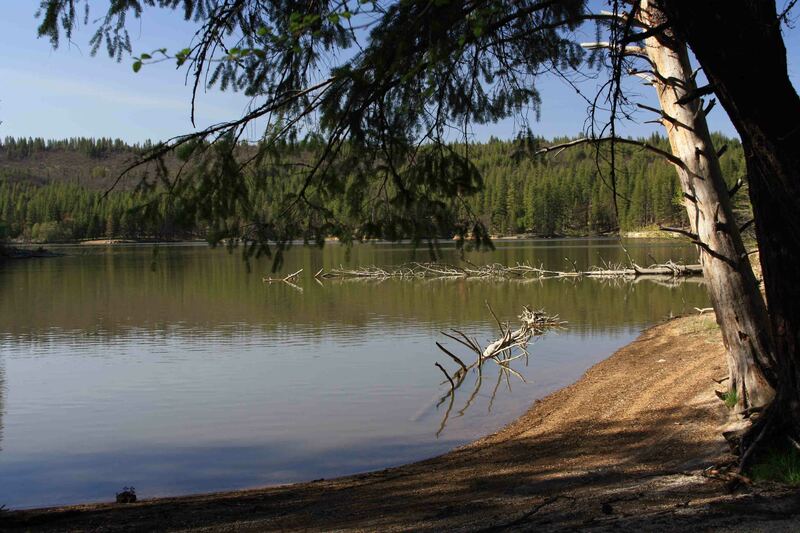 I waited to take the 1.2 mile loop trail until after I took Petey for a 1.6 mile walk to a Lake Britton along a wide path that led though a pine forest. It was the only dog friendly trail in the park and somewhat anticlimactic to arrive at a brown lake with a nutria swimming by. I’m glad I saved the waterfall trail for last. Caving would really “creep” me out, but I’m glad you enjoyed it. Maybe I could explore one cave if I had a buddy with me. You were brave to “go it” alone.